Very good news is coming fro TMC and Mamta Banerjee from the latest exit polls of West Bengal. All of the surveys are predicting that TMC will win in West Bengal easily. Aaj Tak Axis poll is giving 233-253 seats to TMC which are very good in numbers. NewsX Chanakya exit poll is giving 210 seats to TMC. Times Now-C voter and ABP – Nielsen are also giving good number of seats to TMC. Bad news for Left and INC, all polls are giving less seats to them as compared to TMC and the predicted seats are less to form the government in West Bengal. There is no good news for BJP also, all the polls are predicting that BJP might able to touch the double digit in WB vidhan sabha chunav. Chanakya exit poll is giving 14 seats to BJP, which is highest among all the surveys. This assembly election of West Bengal plays a vital role in countries’ politics. The various news channels have done opinion polls to get a better idea about the mood of the voters. The opinion polls have always been a little controversial topic but still these are followed by people to guess the verdict before the results come out. These opinions polls are closer to exit polls, however, exit polls bring a more clear picture of elections. West Bengal Election results will be declared on 19 May 2016, watch out this space for election results. The India TV CVoter opinion poll predicts a win for TMC (Trinamool Congress) with 160 seats. The CPI(M) (Communist Party of India (Marxist)) is expected to win 106 seats, following TMC by a margin. Indian National Congress (INC) and its alliances are predicted to win 21 seats. The picture doesn’t seem nice for BJP (Bharatiya Janata Party) as the parties’ seats are limited to four. The opinion poll claims Mamta Banerjee will retain power yet again in this West Bengal assembly election. The ABP – Nielsen survey also suggests that TMC has a fair chance in this assembly election. You can see that this prediction suggests that TMC will get 197 seats, out of 294 seats. The Left is expected to win 74 seats, which is also a good number but not enough to bring them in WB as ruling party this time. Congress (INC) is believed to bag 16 seats. In this West Bengal opinion poll, BJP doesn’t seem to open its account with the polls predicting 0 seats with them. Others and Independent Candidates (IND) will have a chance of winning 7 seats. The ZEE 24 Ghanta opinion polls are predicting a smooth road for Trinamool Congress (TMC) in this assembly election. The projected seats for TMC are 200 which is a good news for Mamta Banerjee (current CM of West Bengal). The Left Front congress is expected to win over 90 seats. If the survey is to be believed, BJP would bag 1 seat which is not a good sign for this national party. ABP news opinion poll survey also brings good news to Mamta Banerjee and TMC as it predicts a big win of 198 seats. It is a clear majority for the party if the opinion poll is correct. The BJP is expected to bag 12 seats and INC (Indian National Congress) is expected to win 40 seats. The Left front is believed to win 36 seats. Intelligence Bureau has also conducted an opinion poll in West Bengal. This opinion poll suggests that TMC will get more than 184 seats. Left front seems to conquest 70 seats. According to this central organization, congress is expected to get 25 seats with BJP winning 5 seats. As per ETV Bangla predictions, TMC of Mamta Banerjee going to win the assembly elections by a huge Margin. As per their predictions they are going to win at least 201 seats and CPM will manage to gain only 64 seats. ETV Bangla conducted their opinion poll survey on 265 seats. ABP Ananda – Neilson opinion poll forecasts an easy win for TMC by securing 182 seats (148 is required to form the government). As per them, TMC will hit a century (107) in this Vidhan Sabha elections. As per the all the opinion polls, they are predicting that Mamta Banerjee of TMC will win West Bengal polls easily. 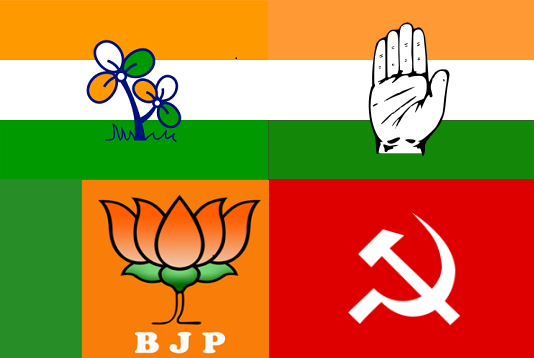 CPI (M) and Congress are fighting against TMC in this election under an Alliance. CPI Alliance will be the second or runner-up party, according to the different media channels. The main political battle is in between the Trinamool Congress and Communist Party of India (Marxist). There is no chances of BJP as per the opinion polls. Even Intelligence Bureau (IB) also predicting that BJP will able to win only 5 seats in 2016 West Bengal assembly elections. You can clearly see that all of the leading and trusted opinion polls are predicting that TMC will win the sixteen Assembly elections. In West Bengal elections which were held in 2011, Trinamool Congress (TMC) won the 184 seats out of 294 seats. The people of West Bengal gave him a clear majority in 2011 Elections, TMC is still the favourite of voters in this election season. These opinion polls are just a survey reports which are conducted on a small number of peoples. Final results can be entirely different. Please share your thought and comments in the comment box, your comments will be lived on this site. BJP may win Bhawanipore assembly seat of Mamta Banerjee which is very important.